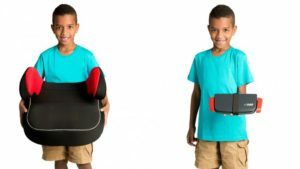 The revolutionary mifold car seat — 10 times smaller than a regular booster and just as safe – has secured a Series AA funding round of $1.5 million led by Sweet Capital, the new investment fund created by the founders of King Digital Entertainment. Altogether, child car safety company, Carfoldio, the maker of mifold, has raised over $3 million in funding from institutional and private investors. “We loved mifold when we saw the crowdfunding video and reached out to [founder Jon Sumroy]. mifold is reinventing the child car safety category and disrupting the market. mifold is a genuinely innovative solution to a real problem that traditional players have ignored. Their worldwide sales are a strong proof of concept,” said Christian Dorffer, CEO of Sweet Capital. “I recognized the hassle that comes along with a regular booster seat when my children were in a carpool, getting picked up by their grandparents, on vacations or in taxis,” said Sumroy. “So I realized that, if I could design a booster that was mighty small and mighty strong, one that kids could take with them everywhere, then they could always travel safely, no matter whose car they were in.